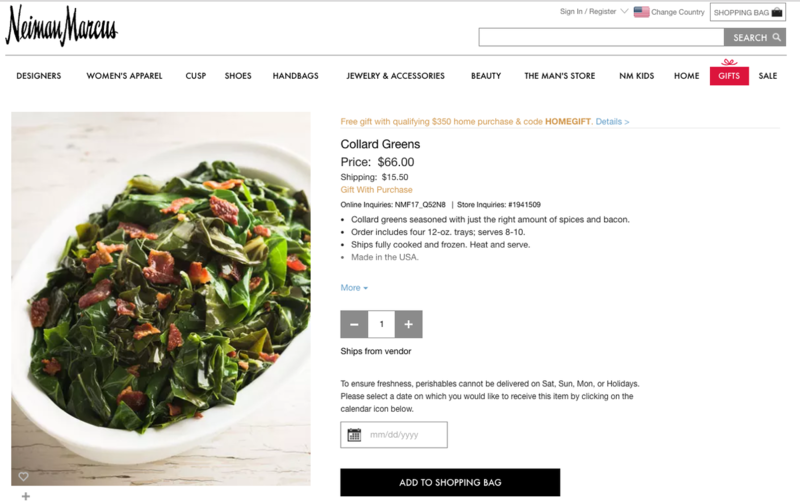 Neiman Marcus Is Selling Frozen Collard Greens For $66 Plus Shipping : The Two-Way The luxury department store is well known for its opulent offerings, but the vegetable dish is drawing scorn and ridicule for its price and has inspired the hashtag #GentrifiedGreens. Neiman Marcus is selling collard greens for over $60, this holiday season. Luxury department store Neiman Marcus is well-known for its opulent holiday offerings. For example, its "Christmas Book" holiday gift guide is offering his-and-hers "Island cars" for $65,000 each. And a trip to castles in the U.K. for eight will set you back a cool $700,000. But a different kind of item is now raising eyebrows: The department store is selling collard greens for $66, plus $15.50 in shipping. It advertises that the vegetable is "seasoned with just the right amount of spices and bacon" and "ships fully cooked and frozen." The comfort food's high price tag has generated scorn and ridicule on the Internet. "I can't even begin to imagine the conversation at the dinner table with my grandmother," The Root said. "Do you know how many pounds of greens you could get for $66 at a grocery store? And, who's cooking these greens? Is there some secret Neiman Marcus kitchen run by a grandmother or Paula Deen?" They "better taste like unicorn tears and Prince's bath water," it said in a tweet. Dear Neiman-Marcus, fire EVERYONE on that PR team who agreed on #gentrifiedgreens. ? ?EV ??RY??ONE! "The Neiman Marcus Collard Greens are a new item we are carrying this year. The order arrives in four 12 oz trays so you choose how much you would like to serve. Overall, the four 12 oz trays serves 8-10 people." If you're undaunted by the price – and hungry — the company also sells a Baked Bean medley for $80; an item called "Oma's Cheesy Potatoes" for $76; and a full Holiday Turkey Dinner for $495.